The Mediplanner® II helps you maintain a Morning, Noon, Evening and Bed medication regimen with this secure 7-Day pill container. 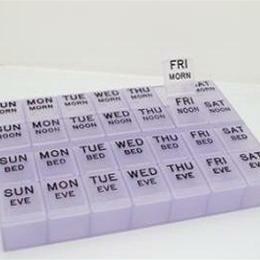 Keep your weekly four time-per-day medication regiment organized with The Mediplanner®. This secure and helpful pill organizer has four coded compartments and 28 snap lids that are easy to read and will keep pills safe within a drawer or conveniently stored on your counter. Product Dimensions: 5.63" x 8.38" x 1.18"
Package Dimensions: 7.5" x 11" x 1.13"